KZSU playlist for Tuesday, Oct. 27, 6:00 a.m. to 9:00 a.m.
* Jacam Manricks — “Rothko” — Labyrinth (Manricks Music, 2009) … A forward-thinking album of contemporary jazz, a bit too cerebral to call “mainstream,” with Ben Monder‘s guitar adding a comforting yet brainy element. It’s also got Tyshawn Sorey on drums, always a good sign. Most of the tracks will come across as “nice” to the average listener, but there are also two pieces with a small chamber orchestra, adding the drama and pull of strings and horns for some good depth. The track I picked, “Rothko,” is none of the above, a very sparse, icy piece that just floats in front of your eyes. There’s apparently a slow, slow 12-tone row going on in there, but really the piece is about atmosphere and stillness. * Andy Milne and Benoit Delbecq — “Ice Storm” — Where Is Pannonica? (Songlines, 2009) … I remember Milne as an M-Base/Steve Coleman disciple, spinning complex 21st-century jazz (in the late ’80s) wrapped in brainy funk patterns. I’m familiar with Delbecq as a more avant-garde improviser, and as the pianist on the terrific free-jazz album Y? (Leo, 1999) by Bertrand Denzler. Not the pairing I’d expect, but they pull it off here. These are piano duet tracks, artsy but with some rhythmic flair, as on this track (one of Milne’s compositions). * Not the Wind Not the Flag — Tintinabulum (Barnyard, 2009) … Varying between niceness, jazziness, and harsh noise, this is a single 38-minute track by Colin Fisher on guitar and Brandon Valdivia on drums. The piece starts in slowness and silence with one acoustic chord struck at long intervals, moves forwards through some more active work, and ends with a pile of electric-guitar distortion and feedback alongside crashing cymbals. Just before the loud part starts, they seem to reprise the lonely chord that started it all. * Rent Romus‘ Lords of Outland are celebrating their 15th anniversary with a limited-edition 2-CD set combining old tracks, unreleased tracks from the past 15 years, and a newly recorded full-length album. 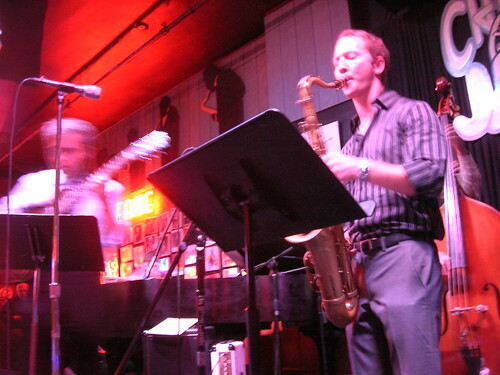 The band has played only sporadically (such is the nature of the free jazz world, especially on the west coast) and has had a varying cast over the years, so the sound has varied quite a bit. You’ll Never Be the Same (Gert Rude, 1995) is mostly straight-up acoustic free jazz with lots of fast playing and Romus doing the two-sax trick occasionally. There’s a buzzy fierceness in there, though, which is a common tie with the newer You Can Sleep When You’re Dead (Edgetone, 2007), which is full of electronics and echoey evil vocal babble. Some permutation of Lords of Outland will be doing a CD release show on Thursday, Oct. 29, at downtown San Francisco’s Luggage Store Gallery. Also on the bill are Eddie the Rat (cool!) and electronics/noise outfit Headboggle. The Velvet Lounge is Fred Anderson’s club in Chicago, a neighborhood bar with cool blue walls and awesome, adventurous jazz five nights a week. Its former home was around the corner, just off East Cermak, in a run-down building; Anderson had to relocate, at considerable expense, as gentrification plans mowed that building down. That was long before the recession. The hole from the demolition is still there, empty. But assuming the Lounge is doing OK financially, the forced move was been for the better. The old place had character — and a multicolored floral wallpaper that screamed out like a colorblindness test — but the new location is clean and smart, without feeling out of place. Every time I’ve been there, someone’s sitting in the back with a styrofoam container from one of the nearby take-out food joints. The bartender is a blue-collar, eastern European type, very friendly and usually talking to one of the regulars in the corner. And 81-year-old Fred is still there some nights, sometimes even working the door himself. I don’t get to Chicago often. When I do, I always try to work my schedule around a Velvet Lounge visit. Friday night, I got off work in time to hit Jazz Record Mart, for better or worse — great store, tough on the pocketbook. JRM happens to be a couple of blocks from Andy’s Jazz Club, and while I was leery of mainstream jazz in a touristy part of town, I also needed to eat, even if it meant a $10 cover. I gave it a shot. The Moshier-Lebrun Group (quintet: sax, guitar, piano, bass, drums) wasn’t too bad. It’s what I call “contemporary jazz,” modern stuff descended from post-bebop modalism (Andrew Hill would be a good model) but with sugar, a velvet sheen that makes the music airy and, for most audiences, an easy eveningtime experience. Contemporary jazz can rock, and this group did, getting especially stormy during one guitar solo. And it does draw from worthy jazz masters like Hill and even Ornette Coleman. But it can lack grit, and its fire isn’t guttural. Still, not a bad way to spend a dinner hour. 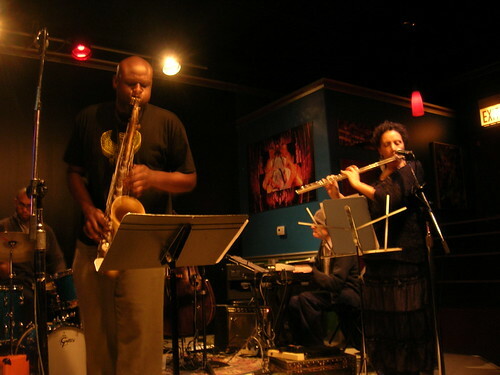 The David Boykin Expanse is a quintet led by Boykin on tenor sax and sometimes he adds rap or rap/singing. He’s got terrific MC skills, delivering supersonic rap packed with creative rhymes, and I think he even freestyled a band intro at the end of the second set. The first piece, “Sunrise,” was a slow, reverent wail in late Coltrane mode. That would be unique in the set; from there, the band went into modern bop pieces with knotted, twisty themes that were mostly upbeat. Solos were usually taken in sequence — Boyken (tenor sax), Nicole Mitchell (flute), Jim Baker (piano), Josh Abrams (bass), drums. Most of the songs stuck to a conventional format, with solos taking place over rhythm and harmony that pointed towards the heads but were really an improvised jam. One exception was “Omni Valley,” the closing piece, where the convoluted rhythm of the theme was retained during the solos. That was really nice, a different color. A fill-in drummer named Avery was especially impressive with his solos. Instead of reaching directly for firepower, he’d often work in crisp, calculated off-rhythms, toying with ideas that keep the swing of the song going but divert freely from the flow (I think I heard a few cycles of 5-time in there). Not everything worked to perfection. Many of the solos seemed to end abruptly, although that could have been a function of me getting absorbed in the rhythm instruments, which sometimes happens. Baker, a great pianist, was having an off night. On one solo in the second set, he gave up early, his hands raising up as if to say, “What the-?” The solo was actually good, but I think he lost his train of thought, so to speak. He got a good-natured round of applause anyway. Baker’s got a crucial role in this band, by the way; it’s in his solos that things get the most “out” and the most convoluted. Wouldn’t be the same without him. The crowd was sparse, as often happens with venues (and music) off the beaten path. That’s a shame. I hope the Velvet Lounge is doing better on average and won’t die of neglect. On the plus side, it was good to find out I wasn’t the only audience member who didn’t already know someone from the band. One couple, in particular, was chatting up the musicians and buying CDs, which was nice to see. 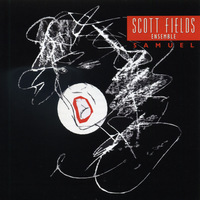 KZSU playlist for Tuesday, Oct. 20, 6:00 to 9:00 a.m.
* Scott Fields — “Eh Joe” — Samuel (New World, 2009) … A sublime track that opens with fluttery sax, brushed drums, and bowed cello. The sound kind of scratches along, picking spots to make a mark while otherwise resigning to a calm flow. While the track later breaks into aggression, with growling sax, rock-sounding guitar, and even some concrete jazz moments, it’s still very different from “Not I,” which is jumpy, chaotic, and jagged. 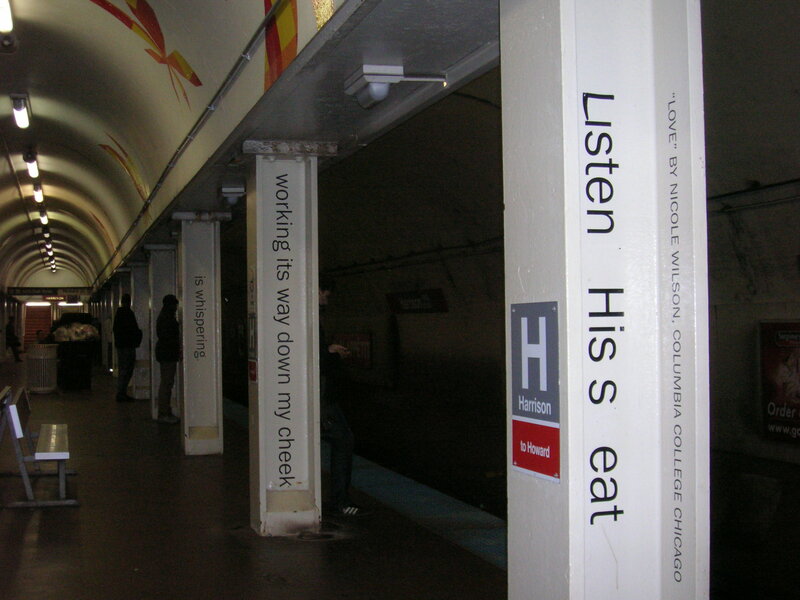 All three long tracks on here are based on Samuel Beckett plays, where Fields turned the words and stage directions into music. That includes a lot of bent inflections, particularly on Fields’ guitar, as if to emulate human speech. A very impressive concept. I’m not familiar with Beckett’s plays, but it would be interesting to correlate the moods of these pieces with the atmospheres of the plays. * Jacob Fred Jazz Odyssey — “The Black & Crazy Blues/A Laugh for Rory” — One Day in Brooklyn (Kinnara, 2009) … JFJO added a lap steel guitarist to this album. This is the opening track, starting with a relatively sad, cowboy-bluesy sound before jumping into the, well, jumping antics you’d expect. Lots of lap steel for a country accent. * Joel Harrison — “High Expectation Low Return” — Urban Myths (High Note, 2009) … Harrison has polished a guitar-jazz sound that’s airy but carries lots of compositional complexity. He tries out some other territory here, including the funk of “125 and Lenox” and the jumbly, fast, free-jazz of this track. It’s not as crazy as Otomo Yoshihide’s take on “Gazzelloni” (which also got played today) but it’s pretty far out for the High Note label. * Hildegurls — “Act IV” [excerpt] — Electric Ordo Vitutum (Innova, 2009) … A remixing of spiritual choral music from Hildegard (12th century nun) with electronics, samples, noise, and solos in English. The starting source is her musical play, Ordo Vitutum, a pre-opera opera. Each of four main acts features a different female composer, in this case Elaine Kaplinsky, embellishing the original. The results combine tradition and soothing vocals with more shrill, theatrical passages; Kaplinsky’s seems to be the most booming of the four acts. Very cool idea. * Tri-Cornered Tent Show — “Broken Toys and Black Orchids” — V/A: Mudwagon: A BlackmetalFreejazzImprov Compilation, Vol. 1 (Edgetone, 2009) … A compilation of mostly rock-minded artists from the Bay Area’s Edgetone label, although a couple of jazz-improv tracks make it here as well (Jim Ryan’s The Spirit Moves Us, for instance). * Dan Aran — “Gul Lihibib” — Breathing (Smalls, 2009) … A nice, open-aired sound with a middle-eastern tinge (which isn’t present on every track of this album). * The Naked Future — “We Fly Beneath and Above the Flux” — Gigantomachia (ESP-Disk, 2009) … A descending crush into chaos. It’s a free free-jazz piece, with everyone going nuts, but anchored by some precise riffs from pianist Thollem McDonas. The album overall is pretty crazy and also features bass clarinetist Arrington de Dionyso of Old Time Relijiun fame. Meliana Gillard‘s Day One is a pleasant and poppy jazz take with a small dash of fusion, courtesy of electric guitar and electric piano. It’s too “sweet” for my usual sound, but I figured I’d give it a go one time. It’s the kind of sound that I’d associate with a summer sunrise, very optimistic. ….. POP NOTES: I went overboard in adding pop songs to the mix this time. That’s just the mood I was in … Madlib‘s latest is a varied mix, of course, because the base sound depends on what record he’s spinning. I went for a kind of ’70s pop-with-jazz-in-it mush track (with samples over it, of course). I enjoy fitting this kind of stuff into the show, for a modern kick. ….. The Lost Fingers are a gypsy jazz band that does ’80s pop covers. Awful old songs done in a folky eastern-European vibe, a combination that can’t help but make you smile. … Americans in France are a high-energy garage rock band, great stuff. The good and bad news (for me, anyway) is that I’ve got a lot of travel in the next several weeks. I’ll be in Chicago, New York, and Orlando. What’s bad is that I’ll have to skip some of my KZSU shows in early November and, because these trips are for work, I’ll do a lot less listening to music. The good news is that I can tap some out-of-town shows. I’ll have a night or two in Chicago — the Velvet Lounge and the Umbrella Music calendars will come in handy there. Sadly, I might have only one night to myself in New York, but it’s a doozy — The Stone is having one of its fundraising nights (meaning John Zorn will be in the house), and, conflictingly, Go Home is playing a rare clutch of shows at the Jazz Standard. (This is the band I’d been lucky enough to see in January.) Wonder if I could make it to one set of each. Then there’s Orlando. Just … just don’t talk to me about Orlando. The New York Times reports that David S. Ware was back on stage Thursday night, his first appearance after a life-saving kidney transplant. The story goes through the whole mini-drama of Steven Joerg (of AUM Fidelity records) putting out his plea to fans over Ware’s situation. The article’s short and heartwarming. The Times interviewed Ware and kidney donor Laura Mehr. Thanks to Avant Music News and Twitterer @lynhortonmusart for pointing this out. The subject was Aram Shelton, who had a few gigs coming up that he wanted to publicize. At the same time, this morning’s interview was a good way for me to find out what he’s up to, as far as organizing shows. He’s been a busy guy since coming here from Chicago to attend Mills College — and that’s without his Ton Trio intact, as one member’s fled to the midwest. * Active Music Orchestra, a 13-piece group that has a monthly residency at The Uptown. This is particularly exciting, because the group will stay together long enough to cohere into a group, something that’s so hard to accomplish these days. They’ll be playing various group members’ compositions. Sadly, I’m a day late in telling you about this, but they’ll be back on the second Tuesday in November. 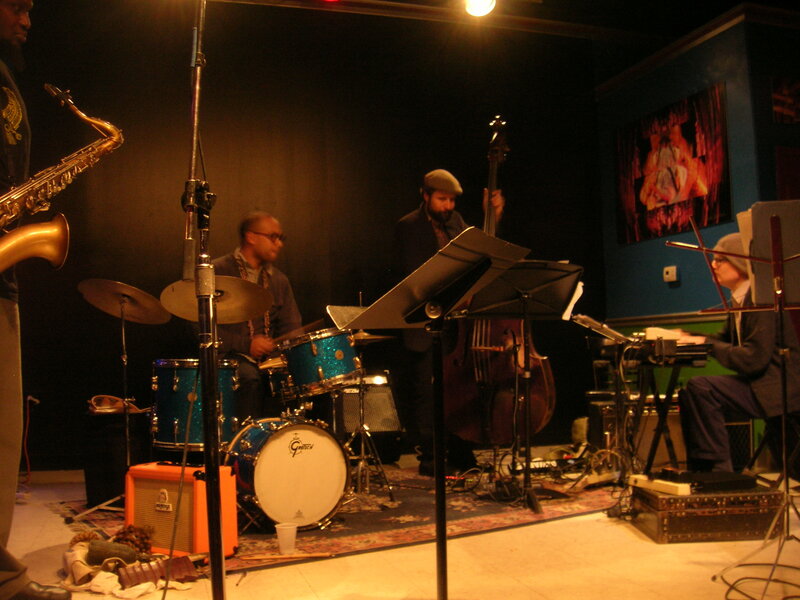 * Ton Trio will be making an appearance, with Chicago drummer Frank Rosaly, at Bluesix on Thurs., Oct. 15. * Aram is part of the newly re-formed Go-Go Fightmaster, which has a new CD (yes!) and is playing as part of the SIMM series: Sunday, Oct. 18, at the SF Musicians’ Union Hall (116 9th St. near Mission). Aram’s compiling a blog of his shows. Awesome title: The Last Time I Played. I’m grateful to Aram for being my first guinea pig. Not that a morning interview is painful or anything; it’s just that Friday afternoon made for easy scheduling no matter who wanted to be on the show, whether live or via phone, whether in person or from the east coast. But when you’re talking Tuesday morning, you get interference from day jobs, sleep cycles, and kids. I sense a lot of Monday evening pre-recording sessions in my interviewing future.